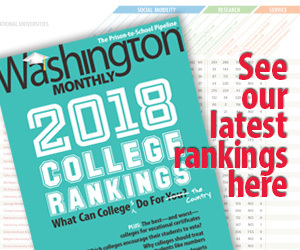 So far as I am concerned, the big political news of the day was the release of Washington Monthly‘s new College Rankings, the real rankings parents and Americans generally should consider as definitive. Paul Glastris did a PA post on this earlier today, but it bears repeating, and for that matter, a ducat in the hat would be helpful to make sure the U.S. News rankings don’t regain monopoly status. * Wingnutosphere beginning to align with Paulites to fight rules changes that require state delegations reflecting primary and caucus results. Moving GOP forward to 1970s still controversial. * Crist to speak at Dem convention. Sorry, I think apostates should sit out one convention. * Kathleen Parker, apparent Rip Van Winkle, unloads on GOP’s positioning on reproductive rights issues. * At Ten Miles Square, Harold Pollack summarizes surprisingly negative Economist takes on Romney. * At College Guide, Daniel Luzer documents effects of pending sequestrations on federal higher ed funding. * Huffpost summary of research on why puberty is occurring ever-earlier for girls. Tomorrow we’ll have to deal with the actual beginning of the Republican National Convention. But it will be late, and probably light.